Microscope Explorer is a supplement for Microscope, the fractal role-playing game of epic histories. The new book is loaded with tools and strategies to get the most out of your Microscope games. One of the biggest challenges is picking an idea for your history: the possibilities are nearly infinite but game time is not. Microscope Explorer includes new step-by-step SEEDS to get you started playing more quickly. Want something novel to spark your imagination? Roll on an ORACLE to generate a random seed instead. UNION transforms the normal Microscope history into a family tree. You go back and fill in the blanks to explore the lives of the ancestors whose unions brought each new generation into existence. CHRONICLE focuses and streamlines Microscope, narrowing the history to the story of a single thing, such as a building, a city or a ring of power. It also brings individuals to the forefront of the story with anchor characters whose lives are intertwined with each chapter of the history. It's a simpler, more personal, Microscope. ECHO lets you muck around with alternate history and cause-and-effect. Travel back in time and change a single moment and see how that change would echo forward, reshaping your history or utterly destroying it. There are also techniques for using Microscope for WORLD-BUILDING, rules EXPERIMENTS and more. Both print and PDF are available now. 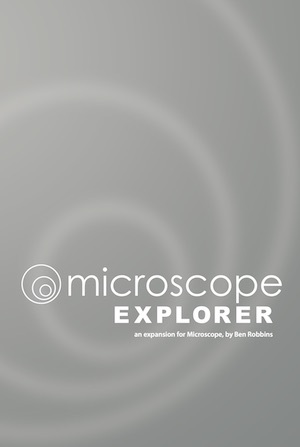 Microscope Explorer is an expansion for Microscope, so you need the original rules to play.